Keith Ranville [His website: A new light shines on the Oak Island Treasure Mystery.] has come up with a differing translation from the generally accepted one. He is of native Canadian descent and has used his native background to find a message on the stone. The message concerns an island two islands to the east of Oak Island (Birch Island) which has a distinctive triangle carved into the north side of the island. 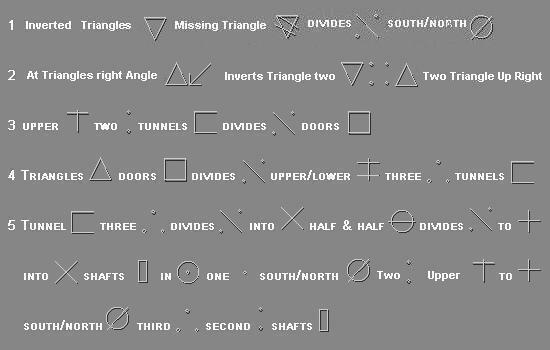 In an email to us, Ranville says: "the forty symbols [on the flagstone] explain about an island two islands east of Oak Island called Birch Island, on the north end of birch Island the impression of a triangle is there. It takes more than half of the Island. You can see the triangle from Google satellite (Google Earth from which we obtained these photos), the triangles that were inscribed on the stone tablet refer to the triangle on Birch Island the rest of the symbols are engineering instructions or explain what goes on in the triangle area on Birch Island there is something of great heritage value there that will interest everyone."